Dogs were kept in kennels where they were fed, cleaned out and watered regularly and had a comfortable place to sleep. They were not petted, walked or groomed. There were electrified fences around each enclosure, and each enclosure had a low roof over it. After a number of weeks the scientists took the roofs off the enclosures and watched to see what would happen. Most of the dogs stayed right where they were, in the knowledge that food and water would arrive at regular intervals. Kelpin, the real heroine of the story, is adaptable and quick witted enough to survive. Others fare less well. Scummo, in taking care of her, finds a role for himself for the first time. 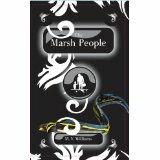 The Marsh People is a story about a captive people who make a bid for freedom and survival, beyond the shelter of the City, on the land around the Burham Estuary. Dogs have rounded up the villagers and herded them into the teeming, inhuman City to work under the control of the Masters. The workers can barely remember their previous lives and have grown used to conditions in captivity. Scummo, however, impulsively makes a bid for freedom, whatever the consequences, taking with him his neighbour’s orphaned daughter, Kelpin. Meeting up with The Outsiders, a group of rebels opposed to the rule of Masters, Scummo meets an array of eccentric and colourful individuals, who, like him desire freedom. But the Masters are not about to allow them that luxury without having to fight for it. A dystopian fantasy. ‘a great imagination on show’.